We decided to take a break from following the Tour de France around and drive down to Pamplona for the running of the bulls – the festival of San Fermin. Growing up, I've read about the event as a vibrant, exhilarating experience, tinged with an element of danger and that was the draw card for my husband and I. The festival is dedicated to the city's first bishop, who, as legend has it, was dragged by bulls through the streets of Pamplona and tortured to death. 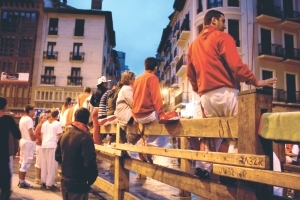 San Fermin, which takes place between 7 – 14 July, and the festal atmosphere, despite the gore, attracts over a million visitors every year . 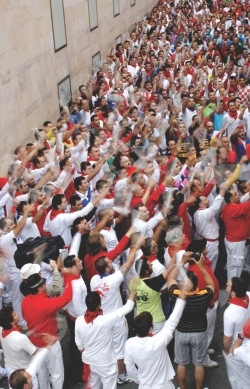 We drove into Pamplona with little knowledge of what to expect and within minutes of arriving in the city, were met with a sea of people in white and red – the entire town had succumbed to the celebrations and sported the traditional red and white ensemble. The carouser thronged streets and pumping music made it easy for enthusiasm to creep in, and soon we found ourselves vying to settle in so we too could join the party. Guidebooks and veteran travellers cautioned that rooms would be near impossible to find during the festival and that camping would be a better option. Thus advised, we approached a policeman to ask about the whereabouts of a campsite. He chuckled and said, “During San Fermin, anything goes. You can even set up your tent in the roundabout if you wish.” And so, that night, in what would have been breaking a dozen laws in other parts of Europe, we set up camp in the shadows of a grand 18th century building. That too, with the aid of two jovial event volunteers. With accommodation sorted we were free to explore the city and join in the revelry. There were street parties around every corner, and stages set up in every square, catering to every taste possible - from the latest pop tunes for Sangria fuelled teenagers to Basque tunes for elderly couples, dancing demurely, more tempered in their consumption of Spain's iconic drink. As we neared the main town square, we could hear screams rent the air. Curiosity got the better of us and we found ourselves in a narrow alleyway, packed with families with young children. Within minutes we realised we'd stumbled upon the children's version of the run. A convoy of men with wooden bulls hoisted on their shoulders charged at the crowd, with fireworks sprouting out of the bulls. Children squealed and cried as sparks flew everywhere. As I ducked out of the way of a stray firecracker, careful to protect my camera from the flame, I noticed a mother dragging her clearly terrified and crying child back into the fray. I guess that's a Basque rite of passage – preparing for running with the giant living (and livid) equivalent in the years to come. The main event, the actual running of the bulls, however, wasn't to be until the morning after. In order to nab a prime viewing spot at the start of the run at 8 am, it is highly recommended that one pushes, shoves or resorts to any other means possible, through to the barriers lining the streets by 6 am. While many chose to party the night away to the pumping music rather than wake up to the generally disagreeable sound of their alarms, we decided that catching a few winks would do well for our adrenaline levels should the need arise. We turned up early enough, not only for a decent spot, but also managed to sneak in a glance at the bulls in their pens prior to the run. If it came down to competing for size, those bulls would've given African elephants a run for their money. A sight like that, combined with my agility, or rather lack of, was enough to dissuade any notions of entering myself in for the run. But I can't say I wasn't tempted, especially when the Spaniards congregated at the start, not 5 feet away from me, and signed away their lives on the waiver forms. The adrenaline was indeed pumping. Spectators line the barriers at the crack of dawn. As the sun rose in the eastern sky, hundreds of runners congregated between the barriers shoulder to shoulder, and thousands lined the streets to watch them. With dozens of cameras pointed at the assembly, they turned as one, towards the tiny statue of St. Fermin, carved into a niche on one of the walls lining the street, and chanted a prayer thrice, for some much needed luck. It's then that I noticed that they each had a rolled up newspaper in their hands. I'm not sure what purpose they were to serve. I doubt swatting the bull away with one would be a very effective tactic. Soon, with a blast of a fire cracker, the bulls were set free. It was as if Moses himself had parted the sea. As the bulls rent the crowd in two, people fell onto the ground, pushed, trampled and rolled onto their way to safety. And it was over in less than ten seconds. In hindsight, it seemed nothing more than a glorified event that our unfortunate house boy back home in Dhaka has to do every year on his way home from the gorur haat. With little to do to channel the pent up adrenaline, the spectators too ran in the wake of the bulls. While chasing the bulls into the bull ring, we were able to take stock of the full extent of the carnage, which was surprisingly little given the size of the beasts. I remember climbing over a stockade to watch a group of paramedics work on a man who appeared to have been merely trampled in the stampede, nothing more gory. But within minutes I chanced upon an unconscious man, bleeding from a wound to his side. It wasn't until the mass bullfight in the bull ring that things got ugly. As we climbed into our seats inside the bullring, about a hundred or so people, none of whom looked anything like a matador, were already in the ring. Into their midst, charged one lone bull. What this one lacked in size, it more than made up for in ferocity. It charged blindly into the crowd, wreaking havoc in its path to the ear shattering cheers from the crowd. It was the first time I'd actually experienced a crowd baying for blood, and it sent a shiver down my spine. And blood is what they got. With so many people playing tag with the bull, it was only a matter of minutes before someone was gored and had to be carried off, and it was relentless. Despite the festive atmosphere and despite the fact that I've seen scores of cattle being sacrificed for Eid, I couldn't help but think about the brutality of the bull fight – a lone bull pitted against an army of blood thirsty humans. Not to mention how degrading it seems towards the bull. However, I can't deny the exhilaration I got from the experience. Plus, I can claim to have run at Pamplona (and perhaps forget to mention the slight detail that it was the children's version of the events).